While serving as a missionary in Central America in 1976, we taught the people how important it was to receive personal revelation. If there was anything we brought up in every discussion, it was the need for the individuals we were teaching to have private personal experiences with the spirit of the Lord in prayer. Each time we met we would ask, "have you prayed about what you are reading in the Book of Mormon?" That would immediately get to the point. With one question we could tell if they were reading and if they were praying. Sometimes we would phrase the request as, "tell me how you have felt as you have prayed about the Book of Mormon." Yes, it put the people on the spot but we were bold missionaries and that was our job - to invite people to discover the truth for themselves. By their response we knew if we were being effective in our efforts. We could usually sense if they had any questions and just how sincere they were in accepting our challenge to read and to pray. We often encountered people who said they read but didn't understand. We would then discuss the importance of prayer. That was sometimes a difficult obstacle to overcome in that predominantly Catholic part of the world. They simply didn't know how to pray. When I first started studying Mormon history, I was a young lad with a lot of simple faith. Yes, I had grown up in the church and had been through Primary and Sunday School but was now in a Doctrine and Covenants class in Seminary. I was fascinated with the background behind the revelations and was always wanting to know more than I was being taught from the official curriculum. The teacher didn't always know the answers to my questions. I have written previously about my early experience in learning about seer stones, and the failure of the Kirtland Safety Society, about Joseph's plural wives and what really happened in Carthage jail. I learned the rest of the story of these and many other difficult things not from the seminary teacher but from my mother, or more accurately, from the history books she gave me. Mother always invited me to pray about the material she gave me to read. I confess that I usually didn't pray about what I read back then. I trusted my mother. If she felt comfortable enough to give me a book to read then it must contain something she believed. It was later in life when I studied the same material as I prepared to teach seminary that I added that depth of specific prayer to my efforts. The prayer was usually something like, "Heavenly Father, how can I teach this material in a faith-promoting way?" There were so many times I would look up and realize that I would be late to go out with the missionaries unless I put the books down and got ready. There was never enough time to explore all the facets of the topic I had chosen for myself to study that day. I remember reading Cleon Skousen's commentaries of the Old Testament during this time. Although he sure added a lot of personal conjecture, it was easy reading and I consumed it in a few short weeks. When I got to the Doctrine and Covenants I found a volume that just enthralled me and kept me on the edge of my seat in anticipation of discovering what marvelous manifestations would come to the prophet next. My copy of the 864-page D&C Commentary from Hyrum M. Smith is marked just as much as my scriptures. I still can't believe that I read it in less than two months. It was from this apostle that I learned the faithful history behind the revelations. On the third day of my fast, I that night determined that I would not sleep until I had received what I wanted. I remembered the story of Jacob wrestling with the angel of the Lord until he gave him a blessing. That was the feeling I had as I prayed. It was an intense struggle. Enos has nothing on me. I raised my voice in prayer with an intensity and passion that I don't think I have felt since. It was an emotional and exhausting experience. And then came the surprising part. It was this: "No, the book you just read did not contain everything that happened in church history. A lot of it was left out. It was written with the intent to encourage faith. You will discover many more things in the years to come. But know this, whatever you learn, you can always rely on this one thing: Joseph did not tell everything he knew and neither can you. Some things you can only receive in faith-filled prayer." You can only know of some things that Joseph wanted to teach when you ask the Lord to reveal them to you directly. That is what Bruce R. McConkie tried to teach us. If we want to know what Joseph knew, we must do what he did and live as he did. No I'm not advocating plural marriage or suggesting that you start a church. But I am inviting you to immerse yourself in a faith-filled study of the doctrines and history and then ask the Lord for more. I promise you that He will provide more as he sees fit - in His own due time and in His own way. I have been consumed in my blogging lately about those who continue to assert that they have lost their faith in the church because of things that they have discovered in their studies of the early history. As an amateur historian, I have had the exact opposite experience. My studies have strengthened my faith and brought me a greater respect and appreciation for the early leaders of the church. I attribute this to the practice of prayer in connection with my studies. I love visiting your Temple Study blog. It is filled with faith and the subject matter is delightful. Well worth the visit. I too enjoy the works of Hugh Nibley, especially his writings about the book of Enoch and the Dead Sea scrolls. Fascinating stuff! I'm with you in everything you've written here. I've read several of your comments on group blogs like Times and Seasons, By Common Consent and Mormon Mentality. Do you have a blog? I'm grateful that you shared your life changing experience on your blog. I share your concern for those who are losing their faith because of the challenges they encounter in their studies. I wonder if we're not seeing the fulfillment in this day of Mosiah 23:21 and 1 Nephi 17:41. It may be that the Lord is testing many in this generation--the intellectuals. The remedy is to ask God, as you did , to show them the truth, but many seem unwilling to pay the price for revelation. In stead, they seem to find their primary strength from FAIR and like organizations to sustain them. I think they do a world of good, but in the end only personal revelation, as you related it in your post, will provide the answers and the healing. I hope I'm not being too harsh on those who struggle with their church history discoveries. It is only recently I have come to appreciate how blessed I was to have been exposed to all this stuff in my youth. I can only imagine what it must be like to learn about it later in life, perhaps when diligently preparing to teach a seminary class. I am not so sure that those who we might consider the intellectuals in the church really rely on FAIR or FARMS or SHIELDS. I think they tend to rely more on their own reasoning and logic. Some things in our history do not seem very reasonable or logical. Men acted back then on faith that defies logic. Entering into plural marriage was not logical. It went against everything that the moral climate of the era dictated. But yes, I stand by my testimony in this essay that prayer, leading to revelation is the best answer to dealing with the distressing issues that can come up in deep searches of church history. I'm even shocked by some of the things I have read recently about the activities of some bishops in Southern Utah in the late 19th century. Crazy stuff! This brings me back to an experience that puzzled me for years. I am find now with it. The thing that disturbs me still is "why granting this experience to a child so young?" I'm not sure if you're referring to my experience with revelation or with that of the prophet Joseph Smith. 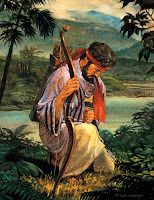 He of course was 14 years old when he received the visit from God in the sacred grove. I was in my early teens when I had some of my first experiences with revelation. This particular experience I have described in this essay occurred when I was preparing for my mission so I would have been 18 or 19. To answer your question as to why the Lord would grant revelatory experiences to someone so young all I can offer is that it impressed me profoundly to be the recipient of such an awesome experience at that age. However, I must point out that my experience is no all that unique, or at least I do not think it is. There are many thousands of young people who can testify to having received revelation from the Lord in answer to their prayers. That's one of the wonderful things about this church - we can know for ourselves that it is true through personal revelation. It does not take away our agency and it does not make us any different from the rest of the world in that we are still subject to the temptations of mortality, but it does give us a sure witness that we can share with the rest of the world when the Lord needs us to do so. I was privileged to share that witness for two years in Central America as a missionary back in the late 70's. Today, that witness is just as strong if not stronger than it was when I first received it. It is real and has remained with me all these years, for which I am grateful. So it makes sense that the Lord would give young people revelation if they ask for it and pay the price to receive it. I has blessed my life tremendously over the years. Awesome post Tim. Thanks so much for sharing. Very inspiring. Your experience with revelation, Tim, is quite different from my own. If I can claim such a magnificent gift as my own, I must say it comes to me without my being aware of it. An idea or a notion is suddenly there, seemingly without provication ... ideas that have no particular realtionship to what I'm reading or studying at the moment ... out of nowhere, so to speak. Thus, I must conclude that the experience is different for each of us. Only in hindsight do I see these moments of insight as revelation. And I find that if I don't get them out - put them on paper or express them to others - they are just as liable to vanish as not. They are truly ephemeral. Thanks for prompting me to consider this aspect of my life by presenting yours. As ever, your insights are remarkable.